As I get ready to return to bitter, frozen New England (in both senses of both words), I, like all of the fellows, am reflecting on my time here in Nablus. Waking up to the sight of Dunkin’ Donuts and snow up to my waist will be an unfortunate change from the view of the Nabulsi mountains from my very window. While I will obviously miss the beautiful vistas of Palestine, and the amazing knafah, it is my students that I will miss the most. 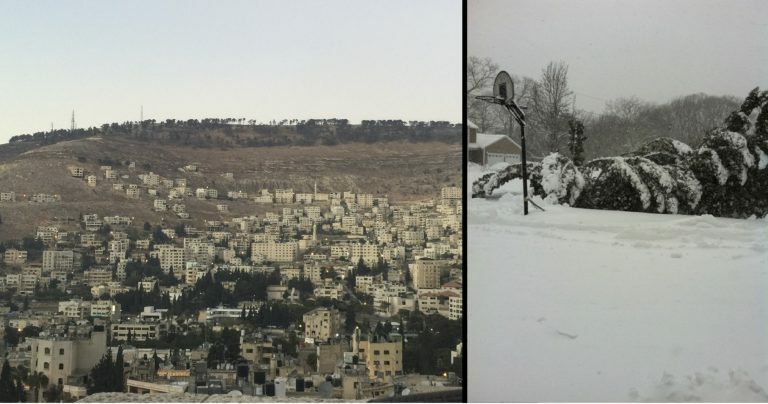 The cold of Rhode Island looks even worst next to the beautiful view of Nablus from the balcony. This was my first experience teaching students who are my own age. Previously, I taught very young Palestinian children in the camps of South Lebanon. This time, teaching my peers, I am leaving feeling that I have made many new friends. Luckily, the students in my class were lively and hilarious. I am almost fundamentally incapable of remaining serious for a four hour language class, so I was excited that my students had a similar sense of humor. While I would like to say I am proud of my students, that is not quite the proper word. I cannot take very much credit for the incredible work they have done in my class. I guided their learning, but it is their dedication that will advance them in life. I could not count how many times different students would stay after class and show me a piece of writing they had been working on, or reveal they had a secret, quite extensive, vocabulary list tucked away in their notebook. Watching my class write, direct, and perform a complicated short skit was amazing. My only concern is that my students are better writers than I am, though they were always more creative. I am left only hoping that one day I could eventually accomplish in Arabic what they have accomplished, with ease, in English, inshallah. EFL Fellow Mike and his EFL class get a few laughs in following the mid-session celebration. As always, I find myself stunned and awed by the resilience, strength, and openness of the Palestinian people who always extend the warmest possible reception to foreigners. I am often told I cannot stop talking, and I appreciate being surrounded by people who share the same problem. I actually enjoy being unable to walk into a cafe or a falafel shop without having a fifteen minute conversation about where I’m from and what I’m doing in Palestine. Thoughts of Palestine will surely comfort me through the frigid northern winter, as I sit by a fireplace, or rather, curl up around the slow-burning coals of my argeeleh [hooka], and remember my students and friends. Thank you for welcoming me into your country and تعيش فلسطين [long live Palestine]!